St. Christopher’s Church is a growing and vibrant Episcopal community striving to reveal the light of Christ as a beacon of love in the world. At St. Christopher’s, we are a warm, welcoming parish where our members will be challenged in their commitment with Jesus Christ. Our relationships with one another and with God are at the heart of who we are. One of the great saints of the Church, St. Augustine of Hippo, famously prayed, “Oh, God you have made us for yourself, and our hearts are restless, until they can find rest in you.” Jesus said, “Come to me all you who are weary and burdened and I will give you rest (Matthew 11:28). While all of us have times in our lives when we are restless or burdened, most of us also have times of joy and thanksgiving. St. Christopher’s Episcopal Church is a “come as you are” kind of place. So come. Come and rest or come and jump right in to help us do ministry or come and be joyful. Whatever state you are in and for whatever reason, please do come. One other thing, you don’t have to dress up, (unless you want to) and your kids don’t have to look like they’ve stepped out of a magazine, (unless they have). I hope to be able to greet you personally and to welcome you. Whether it’s me or one of our greeters, know that we do not take lightly the fact that you are walking into a new place, possibly a new style of worship and possibly even with hopes of a new way of life. Be at peace. We won’t overwhelm you. We will welcome you. Welcome to St. Christopher’s Episcopal Church. Our greeters, ushers, and clergy will be pleased to answer any questions you have about the worship service, our campus, family activities and upcoming events. Look for these friendly faces to help you: Greeter, Usher, Vicar, Deacon, and the Mission Committee Member of the day. Is St. Christopher’s the Right Church for You? It is hard to know if this is the right church for you without knowing you. But if you visit with us, we will do our very best to help you answer that question for yourself and for your family. Moreover, whatever you decide, we will love you in the process. One thing we do know for certain, a relationship with Jesus Christ as Lord of your life will make a difference in your life as it has made a difference in the lives of others throughout the ages. The St. Christopher’s community is characterized by a genuine spirit of warmth and welcome. You will find here, not only a place to fit in, but also a place to serve in whatever way you are gifted and inspired to participate. Our pastoral care team is amazing. You’ll be cared for in times of illness or hardship. Children and youth are an integral part of our community. We love having little ones in church and we value the participation of youth in our worship. Finally, we like to have fun. We enjoy each other’s company and we love to laugh. We have a great coffee hour! There are a variety of ways to get to know members of the church outside of Sunday mornings. There are small dinner groups that meet in one another’s homes and occasional social gatherings at the church. No matter your age or life-circumstances, we hope you will come and experience worship in a traditional, reverent and inviting way – worship and belonging that can transform your life and your family. 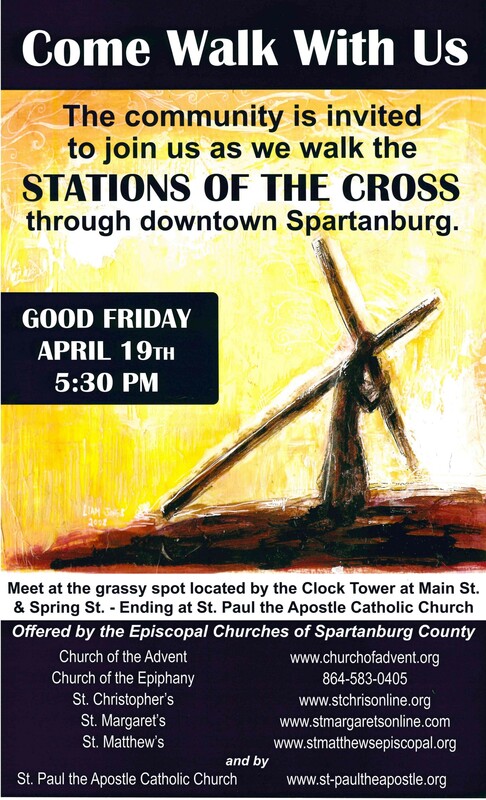 St. Christopher’s Episcopal Church is a worshiping and serving community of followers of Jesus Christ. 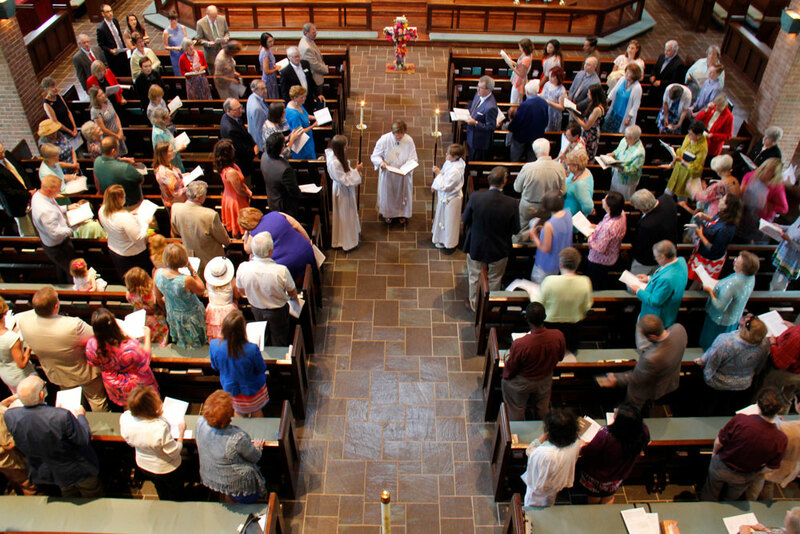 This church is part of the wider Episcopal Diocese of Upper South Carolina, The Episcopal Church in the United States, and the world-wide Anglican Communion. The Episcopal Church has deep roots in America that go back to our country’s founding. Many of the colonists came out of the Church of England and were what we now call “Anglicans”. These historical and far-reaching connections mean that the St. Christopher’s is part of a vibrant, missional, world-wide community of Christians. Our “style” of worship is both traditional and relevant. We worship using the beautiful liturgy of The Book of Common Prayer. The form of our Sunday service is designed to help people of all backgrounds to encounter God and to make faith in Jesus Christ real for our lives out in the world beyond the church. In all things we acknowledge Jesus as Lord. Each week you will experience wonderful music, relevant prayers, and preaching that speaks both to your mind and to your life. Our worship includes the sacrament of Holy Eucharist (Communion) which is a sign of God’s grace at work in us. We look to the Holy Scriptures as the Word of God and to the Old and New Testaments as containing all things necessary for salvation. 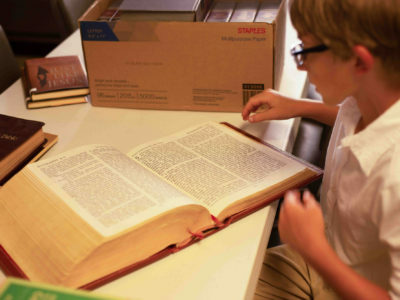 We study Scripture, find it to be a source of comfort and direction, and we seek to apply its guidance to our lives. We believe that Jesus Christ is “God with skin on” and that God in Christ is love. That is to say, Jesus is God who came to dwell on earth, Jesus is God in our lives as the Holy Spirit, and Jesus is God who will come again to redeem the whole of the creation. In this trinitarian God is the manifestation of life-giving love. Through faith in Jesus Christ – his life, death and resurrection, we rejoice in the grace that comes from knowing that we are reconciled to God and that the doors of eternal life are opened to us. We don’t preach guilt. We live gratitude. We seek to share grace with others both inside and beyond the church doors. You don’t have to sign a document or a statement of faith to be at home at St. Christopher’s or in the Episcopal Church. Each week during our Sunday services and at other times, you will hear what we and other Episcopalians believe as we say and pray the historic creeds of Christianity; the Apostles’ Creed and the Nicene Creed. As you get to know this community, as you worship, pray and serve with us, you will begin to experience and live what we believe – that God who began a good work among us will bring it to completion by the day of Jesus Christ (Philippians 1:6, paraphrased). Every Sunday, children (birth to age 5) may be brought to the nursery in the administration building from 9:45-10am for supervised play. Children will return to their parents in the church before communion. 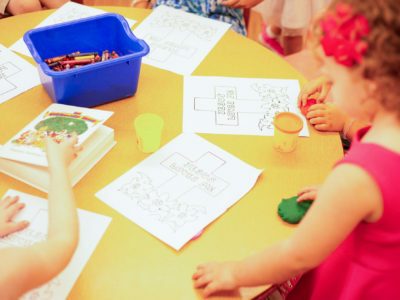 Christian Ed is offered to children, youth, and adults. Classes for everyone will meet the first and second Sundays of the month following coffee hour. 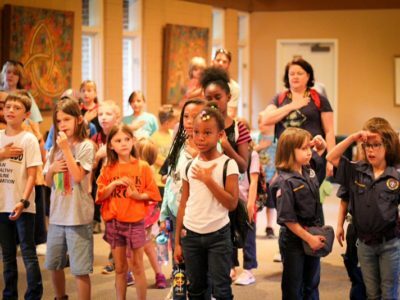 Boys and girls, ages 6-11, are welcome to join our scout troop which meets Wednesdays from 6:30-7:30pm. Please contact Kris Neely for further information: NeelyK@smcsc.edu. Join us each Sunday at 10am for Rite II Holy Eucharist using the 1979 Book of Common Prayer and the Episcopal Hymnal. This liturgy uses traditional hymns and occasional songs of praise. During the seasons of Lent and Advent, Rite I Holy Eucharist may be used. Compline is a service of readings and prayers, led by lay people or clergy. It is one of the most ancient Anglican forms of worship and was the final service of the day in monastic life. We gather in the church for this short service. Currently on Wednesdays, we gather for Celtic Evening Prayer with prayers for healing. Come experience this calming service of scripture, prayer, and music in the intimacy of the Parish Hall. Stay for supper as a community. A short program will follow. 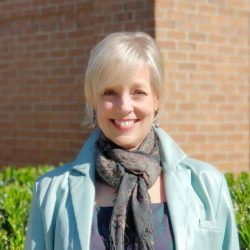 Debbie found her way to ordained ministry after years working in not-for-profit advocacy organizations in Washington, DC where she and her family lived for twenty-four years. She grew up in the northeast, mostly in Connecticut, and graduated from Ithaca College in Ithaca, New York with a Bachelor of Science degree in Recreation Management. 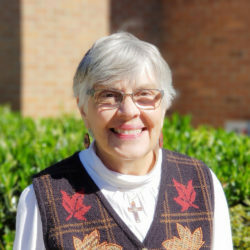 In 2000 Debbie was accepted into the process toward ordination in the Diocese of Virginia. She attended Virginia Theological Seminary in Alexandria, VA and earned the degree of Master in Divinity in 2003. She was ordained in that same year. 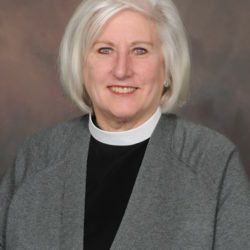 In August of 2003 Debbie was called to St. Francis in the Fields Episcopal Church as Associate Rector for Discipleship. She and her family moved to Louisville, KY to accept that call and she served at St. Francis for eleven years. 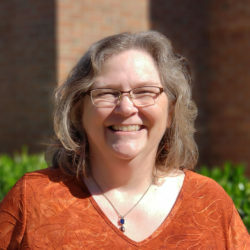 In 2014 Debbie returned to school and earned a Master of Christian Spirituality degree from Bellarmine University in Louisville. 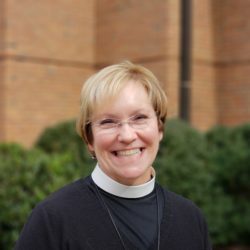 Debbie began serving The Episcopal Church of the Advent, Spartanburg, SC as Associate Rector for Christian Formation in January of 2015. 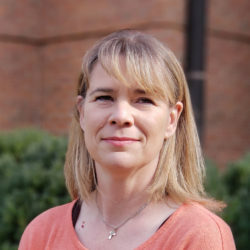 She was appointed Vicar of St. Christopher’s in November, 2018. Debbie has three grown daughters, a son-in-law and a granddaughter; Kelley, Jason and Elsie Tate Lyle (Birmingham, AL), Mandy Apoldo (Spartanburg, SC), and Emmie Apoldo (Charlotte, NC). She enjoys travel and exploration, reading and audio books, SEC Football and Basketball, theatre, and family time.dit button to change this text.